Last year, Piper-Heidsieck unveiled their first rosé expression of the famed prestige cuvée Piper-Heidsieck Rare. Appropriately, production was small and this champagne is a consequent rarity, with just 150 bottles initially released in the UK. We met with head winemaker Régis Camus to taste the brand new champagne, Piper-Heidsieck Rare Rosé 2007, sample some older vintages of the blanc counterpart and discuss another upcoming UK launch. Régis began with an overview of the 2007 growing season. Acknowledging that they hadn’t selected an easy year to be the first Rare Rosé vintage, he described it as an “unusual year for the vineyard, with extremely early growth which then suffered a period of cold weather.” Whilst it was an average season for Chardonnay, fortunately the strength of the Pinot Noir made a vintage possible, although the blending decision was a difficult one. “We spent several years reflecting on the selection of grape varieties that would be best suited to the rosé version of our prestige cuvée,” Régis commented. After eight years in the cellars – the same time as the blanc equivalent – it has developed an impressive richness and luscious fruit-driven character. 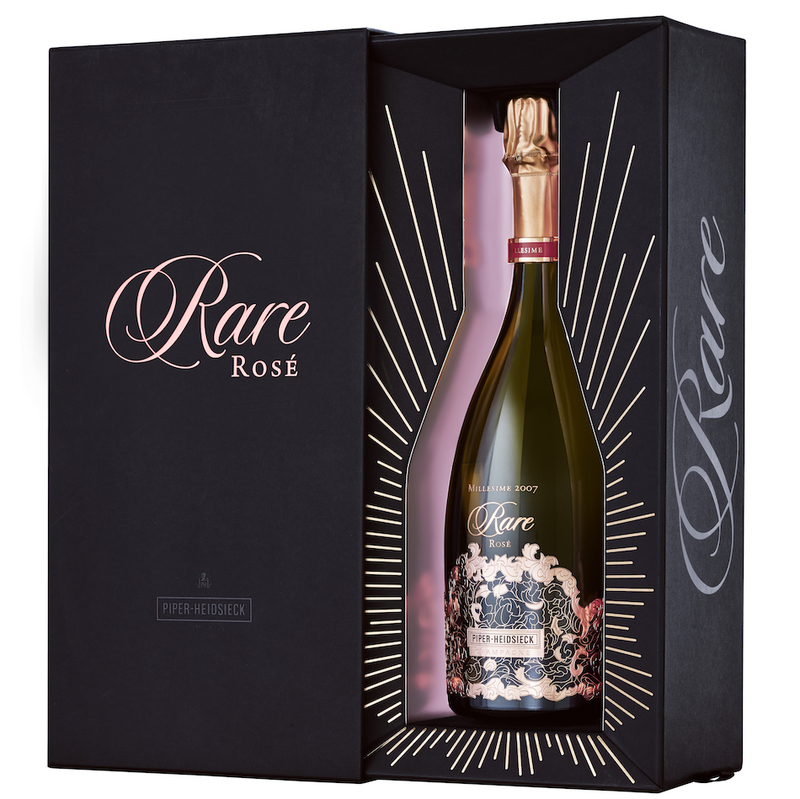 Intriguing flavours of exotic herbs, vanilla and a delightfully spicy finish are the mark of the champagne, an astonishing first attempt at a prestige cuvée rosé that is sure to develop layers of complexity with time. Fittingly, each bottle is presented in an individually numbered box made of lacquered black wood and rose gold metal. 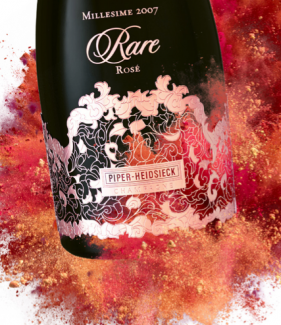 The next Piper-Heidsieck champagne to hit the UK market is Piper-Heidsieck Essentiel Cuvée Réservée NV. Produced for the first time in 2008, this has previously been exclusive to the French market, but will be coming to the UK this year. Régis explained that the concept behind Essentiel Cuvée is to take the finished Brut NV blend, keep it on the lees for 12-18 months longer than the Brut NV and use a lower dosage – just 5 g/l compared to the Brut’s 9-10 g/l. The resulting extra-aged extra brut champagne is “the pure expression of Piper-Heidsieck style: a structured, crisp and ardent wine,” according to Régis. The example we tasted was served from magnum and based on the 2012 vintage. In an attempt to highlight the unique character of Essentiel, Piper-Heidsieck have displayed addition information on the back label including disgorgement and cellaring dates to communicate the extra level of winemaking detail – a move they have replicated across their range. 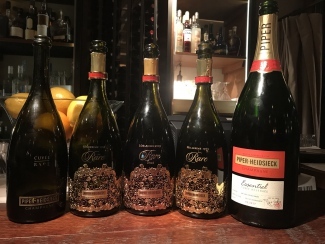 We also tasted some very old vintages of Piper-Heidsieck Rare, of which there have only been seven since the first release: 1976. Alongside stunning examples from 1979 and 1988, we sampled Piper-Heidsieck Cuvée Rare NV. 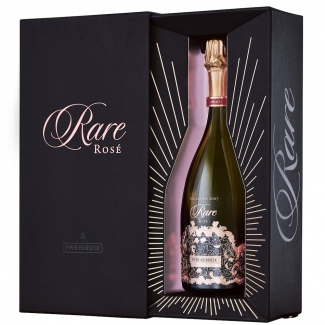 Misleadingly, this was technically Rare 1997 and represents Piper-Heidsieck’s foray back into producing prestige-cuvées after a ten year absence. During the period of the late 1980s and early 1990s Piper-Heidsieck was part of the Rémy-Cointreau group, alongside Krug. In an attempt to prevent competing champagnes impacting the prestige image of Krug, other champagne houses in the Rémy-Cointreau group were prohibited from making prestige-cuvée blends. When Krug was sold to LVHM, Régis asked to get Piper-Heidsieck back into the prestige cuvée market and Cuvée Rare NV (or 1997) was the first step. Has a lovely richness on the palate and a creamy yeast-lees character coming through. Dosage seems about right, a dry finish, very refreshing but full of richness. When you go back the lemon and chalky character comes out quite strongly. Very good. Smells very aromatic, lovely delicacy and some Turkish delight notes. Loads of red berry fruit, very fresh acidity and bundles of strawberry. Dosage seems low, very delicate and lush. An abundance of raspberry, red currant and ripe plums flavours. Some spicyness and a lovely long finish. Wow. Although released as a NV, this is from 1997. Lovely nose, like some of the 80s Charles tasted recently. This has so much creamy caramel. After some time it had become quite liquorish, apparently typical of Rare. Lovely creamy caramel and the richness on the palate is amazing. Loads of lime and lemon and all that secondary nutty character comes through. More mushroomy notes dominate the finish, amazingly long length and that creamy character just comes out more. Still is amazingly fresh. Amazingly short lees contact. Has a really distinctive nose, bursting with mushroom, rich dried apricots and citrus notes. On the palate there is a big mouthful of fruit, creaminess and long length. This has some oxidation, but the bottle has been open 24 hours.